Overall, this instrument is in excellent condition. The soundboard, bridges and keys are perfect showing no chips, splits or cracks. The beautiful high-gloss finish is in near-perfect condition. There are a few shallow, insignificant surface scratches resulting from normal use, but there is no serious damage to the cabinet. The lyre and music desk are in excellent condition. 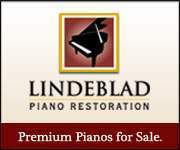 This piano has a rich and powerful voice with a full, round bass and a crystalline treble. The action is smooth and responsive. This instrument has recently been cleaned and tuned. It's ready to enjoy in your living room! Larry Fine, highly respected author of "The Piano Book", says that Schimmel Pianos are "terrific pianos with great sound and workmanship". 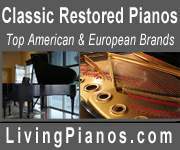 He gives Schimmel pianos four and a half out of five stars for Performance and Confidence and five stars for Quality Control. Schimmel no longer offers this particular model, but a comparable brand new model has a list price of $40,400. Save thousands with this slightly used model. Matching padded adjustable Artists bench included. Long distance delivery is no problem!